Domaine de Colette is in the small village of Lantignié, regarded as the top village in the cru. It's owned by Jacky and Evelyne Gauthier and is located is less than 1 kilometer from the border of Morgon. The soils at Colette are worked organically in an effort to promote healthy and vigorous root systems. They limit vine treatments during the year and intervene only when completely necessary. ​A green harvest is performed to give more concentrated grapes. Harvest is by hand, and only healthy grape clusters are emptied into the tank. Humble Jacky Gauthier has enlarged his property by nearly a third since we began working with him 15 years ago, having purchased additional vineyards in Fleurie and Moulin-a-Vent. Gauthier does not make wines using only indigenous yeasts from biodynamically-farmed vineyards, aged in old foudres and bottled without filtration. Jacky works conventionally, limiting yields in his vineyards with his old vines, spraying only when when the health of the plants are at risk, using a pied de cuve to begin fermentation, then aging the wine in neutral, cement tanks. The result is a delicious mouthful of ripe Gamay, whose granite soils provide minerality and whose excellent exposure allows the burst of the Beaujolais fruit we know and love. This comes from a steep slope from which, on a clear day, Mount Blanc can be seen. It is made with fruit from 80 year-old vines, fermented with carbonic maceration followed by a gentle pressing, aged in cement tanks for 10 months and bottled without filtration for our gustatory pleasure. Regnié is located just south of Morgon and north of Brouilly. It is known as the fruitiest of the Beaujolais crus, and Colette’s old vine release exemplifies the forward, explosive aromas of Regnié and Colette itself. Tasting notes: strawberry, raspberry, spice and an underlying granite-infused minerality combine to make this one hell of an enjoyable glass of wine, with or without a food accompaniment. This comes from a steep slope from which, on a clear day, Mount Blanc can be seen. 80 year-old vines, carbonic maceration followed by a gentle pressing, aging in cement tanks for 10 months and bottled without filtration for our gustatory pleasure. Fleurie is one of the best known crus in Beaujolais. Its vines are grown on a particular pink granite that help to produce wines that are light, silky and supple with characteristic floral and berry aromas. This wine is thoroughly delicious! 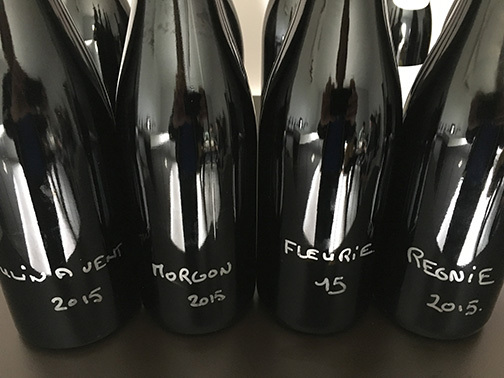 Jacky and Evelyne Gautier have been using a modern label of their top Morgon cuvée from a parcel called Charme, but we prefer their classic label, so we have them bottle the wine with something more traditional. This wine comes from 80 year-old vines planted on south facing schist slopes that, after a strict selection, is vinified by carbonic maceration then aged in cement tanks. It has slightly more structure than the other Colette wines, which certainly makes putting a few bottles away for future consumption sound like a great idea!